RANGE 2 sizes available in a variety of patterns and colours. 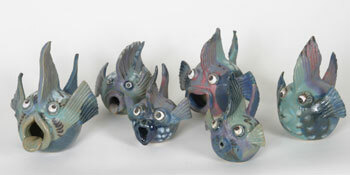 DESCRIPTION Created from little spheres with slab and modelled details, these fun pottery puffer fish come in a variety of designs. Each piece is glazed in bright turquoise, pink and blue.